It is important to acknowledge that there are two types of Heat Pumps, Ground Source Heat Pump and Air Source. Both have their own applications and both are more suitable for particular types of building and properties, depending on the requirements. This article aims to look at Air Source Heat Pumps and give an overview as to their benefits and drawbacks. An Air Source Heat Pump absorbs and extracts heat from the outside air. It works in much the same way that a fridge extracts heat from the inside to keep it cool. This heat is used to heat the home via traditional methods such as radiators. It can even provide the hot water. An Air Source Heat Pump is an external box, very similar to those utilised in an air conditioning system that needs to be positioned on a suitable, preferably sunny, external wall, which has a clear air flow and isn’t obstructed. Heat from the air flow is absorbed into a fluid which is pumped through a heat exchanger which is inside the actual Heat Pump. This heat is considered ‘low grade’ so it then passed through the heat pump compressor, which compresses it and concentrates it into a higher temperature ‘useful’ heat, which is capable of heating or providing hot water. The system can continue to extract the heat from the air even when the temperature is as low as minus 15 degrees Celsius. 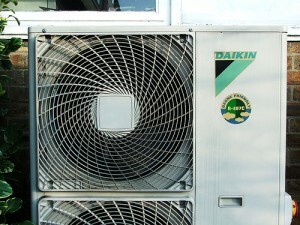 There are two main types of air source heat pump available in the market. Air to Water System: This uses a wet central heating system to distribute the heat and hot water. This is the most common system available because it uses existing technology in most households and buildings. Air to Air System: This distributes the heat using fan circulation throughout the property. Because this system uses hot air to heat the building it is less likely to provide the hot water as well. What are the benefits and drawbacks to Air Source Heat Pumps? Firstly, the Air Source Heat Pump is not entirely green. It relies on electricity to work and to keep the pump operational. Although it can lower fuel bills, the actual reductions can be less depending on the fuel type you are replacing. For example, if you have converted from electric heating the saving can be substantial, but from gas, less so. The system also does not produce the level of heat that gas or oil boilers do. The Air Source Heat Pump delivers a lower temperature but over a much longer period. This means that during cold spells or the winter the heating may have to be left on all the time to heat the building efficiently. The radiators will never be hot to the touch like with a conventionally fuelled system. To maximise the efficiency of an Air Source Heat Pump the building itself also needs to ensure that it is well insulated. Because the heat output is lower than with a conventionally fuelled system, the building needs to be well insulated and draught proofed to prevent heat loss. Although there are little ongoing costs for maintenance, the user will have to ensure that the external Air Source unit is kept clean and the area surrounding it clear. The initial installation costs can be very high, much higher than fitting a new conventional heating system on an existing building. However, the ongoing cost savings and efficiencies can far outweigh the initial costs. Fitting a Heat Pump into a newly built building can help to reduce the costs. As previously mentioned having an Air Source Heat Pump can help to reduce fuel bills on a property and, by extension, can help to reduce your carbon footprint. As a user you won’t be reliant on fuel deliveries or combustible fuels, just the electricity to run the actual system. The unit is very low maintenance system, so ongoing servicing costs are much reduced. In a world where conventional fuel sources are diminishing, Heat Pumps represent an excellent alternative. Although they do have drawbacks the benefits are substantial, both in long term cost savings and in carbon footprint reductions. It is definitely a technology to consider if you are looking for renewable technologies in the future!